Name Necklace Claudia has a beautiful and elegant shape font is extremely trendy. The name is a chain made of the first grade silver. This name necklace Claudia comes with a silver link necklace jasseron of 45 cm. 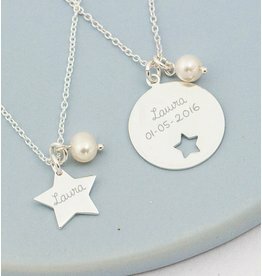 Beautiful symbolic gift for that beautiful mother and daughter bond. 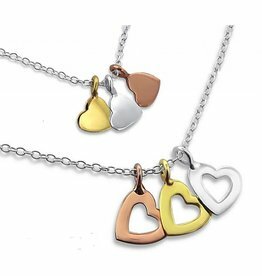 The second heart are beautifully gilded gold (silver with a layer of real gold). What will you shine with your hearts of gold! What will julle rays with this set of two .925 silver chains. The three hearts in silver and gold plated rose and gold symbolize your band. The hearts of your daughter fit into yours, how sweet is that ?! How sweet, a .925 silver chain for mother and daughter. The beautiful inscription of the girl is' Like daughter' and mom has the text' Like mother.A wonderful personal gift. 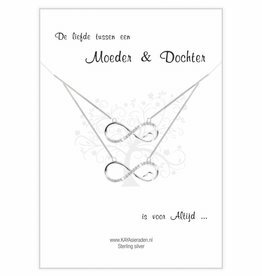 Dear symbolic necklace made of through-and-through .925 silver. The text is beautiful: Family is a circle of strength and love. " Including Necklace. Give a symbolic gift! 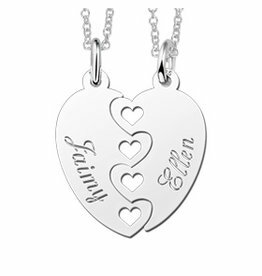 These silver chains symbolize the unconditional mother daughter bond. The girl holds the key to her heart mommy, supplemented with 2 crystal hearts. How sweet is that? 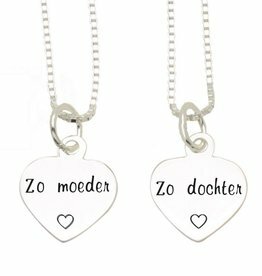 Two beautiful through-and-through silver necklaces with a beautiful text that confirms the love between Mother and Daughter. The hangers are pre-engraved, so delivery in one day! Including Necklace & Mint. Symbolic set for mother and daughter, the two intertwined hearts say, "The love between mother and daughter is forever." Through-and-through 925 silver. Each piece wrapped in a silk pouch, equally ready to give away. A gift becomes really unique by providing it with an engraving, a lasting memory for later. Luxury wrapped in a pink sieradenbuideltje, as ready to give! 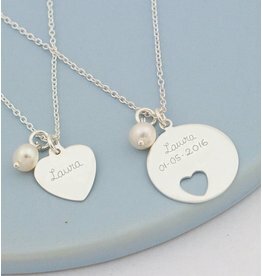 Beautiful symbolic gift for that beautiful mother and daughter bond. The heart is beautifully plated (silver with a layer of real gold). What will you shine with your hearts of gold! Wonderful greeting card to confirm the love between mother and daughter. You will receive a luxury greeting card showing two .925 silver, luxury finished with 17 sparkling CZ stones. Beautiful gift!